VilmaTech.com > VilmaTech Blog > LogMeOnce Review 2019: Best Free Password Manager? LogMeOnce Review 2019: Best Free Password Manager? If you are still using your dog’s name, your birthday, your last name as passwords to log in to your account, you are facing a big problem and at risk of suffering a breach. A password manager relieves the burden of thinking up and memorizing unique and complex logins. It helps you remember all your passwords and lets you autofill passwords for all your apps and websites in seconds, saving you a lot of time. LogMeOnce is an excellent password manager and used by millions of users all around the world due to its multiple powerful technologies and remarkable features. Check out LogMeOnce Review 2019: Best Free Password Manager here and get the best protection you need for your online information across all your devices, including phones, tablets, and personal computers, for FREE. LogMeOnce is a high-quality password manager used to manage all your passwords. It can create, store and organize all your passwords for your computers, websites, applications and networks for you, while also protecting all your important online information. Millions of people and thousands of businesses depend on LogMeOnce password manager and digital vault to substantially reduce the risk of a data breach. As one of the world’s leading password managers, LogMeOnce has all of the standard password manager features that you want, additionally it adds a digital wallet, a password strength report through an internal audit, and biometrics support. It secures your passwords, documents and sensitive digital assets with Two-factor authentication to make you get peace of mind all the time. So, if you want super secure passwords for your multiple online accounts, but you do not want to memorize them all, LogMeOnce password manager is the way to go. LogMeOnce offers cross-platform application for Windows and Mac computers, as well as iOS and Android mobile devices. It supports on browsers including Google Chrome, Mozilla Firefox, Apple Safari and Microsoft Internet Explorer. LogMeOnce protects your passwords with military-grade AES-256 encryption technology and offers Two-factor authentication to ensure no one else can log into your password vault. With LogMeOnce, you don’t need to worry about weak passwords and password reuse that could undermine your internet security. You don’t have to spend most of time on password reset request anymore. LogMeOnce is designed to keep personal information secure while making it convenient for the user to login with their account information across multiple websites and platforms. 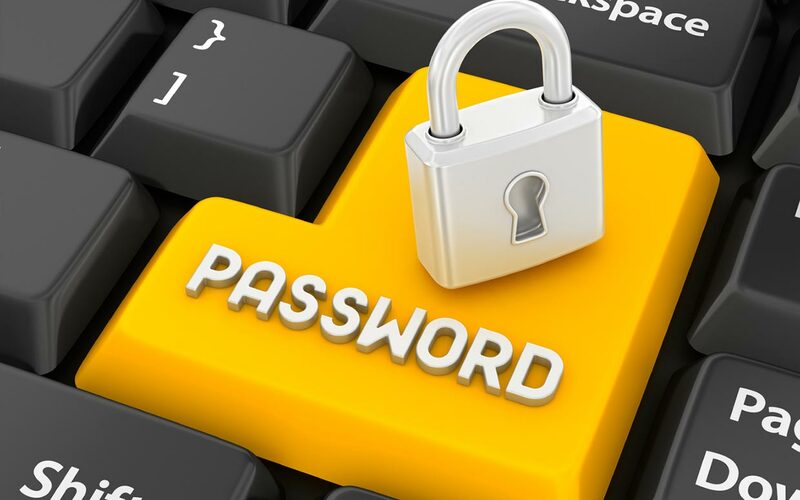 It makes remembering your password and logging into your accounts quick and easy and turns your digital life easier. Reusing passwords is dangerous because if just one site suffers a security breach, an attacker could access your entire digital life: email, cloud storage, bank accounts, social media, dating sites, and more. And if your reused password is weak, the problem is that much worse, because someone could guess your password even if there isn’t a security breach. LogMeOnce offers a full set of features to protect your personal data by securing and strengthening personal passwords, and it gets rid of the problem of utilizing the same password for multiple websites. Its Auto-Login feature simplifies login and account creation tasks which is a big time saver. In addition, LogMeOnce offers a comprehensive number of login options with automatic 2FA. You can select Photologin, Fingerprint, Pin Code and Password to log in LogMeOnce whenever you need it. And you always get the extra security layer of 2FA without the hassle of typing yet another password, SMS code, or a 2FA token. The biggest highlight of the password manager is LogmeOnce Mugshot. Unlike other consumer password managers, LogMeOnce doesn’t only prevent hackers from accessing your accounts, it also helps you catch them in the act. This new feature tracks unsuccessful log in attempts on your account, then takes a photo of the “hacker,” logs their IP address, GPS location, and adds a timestamp before emailing all of this over to you without the intruder knowing. LogMeOnce is totally free, with no limit on the number of saved passwords or on the number of devices you use. Certain advanced features aren’t available in the free edition; gaining access to those requires that you purchase LogMeOnce Password Management Suite Ultimate. Overall, LogMeOnce is a reliable password manager that offers a variety of protection features to help safeguard your login information. Enjoy secure computing while protecting your passwords and IDs with Military-Grade encryption technology. Try LogMeOnce for free now! At present, LogMeOnce offers 3 pricing plans: Free (Premium), $1/month (Professional), and $3.25/month (Ultimate). 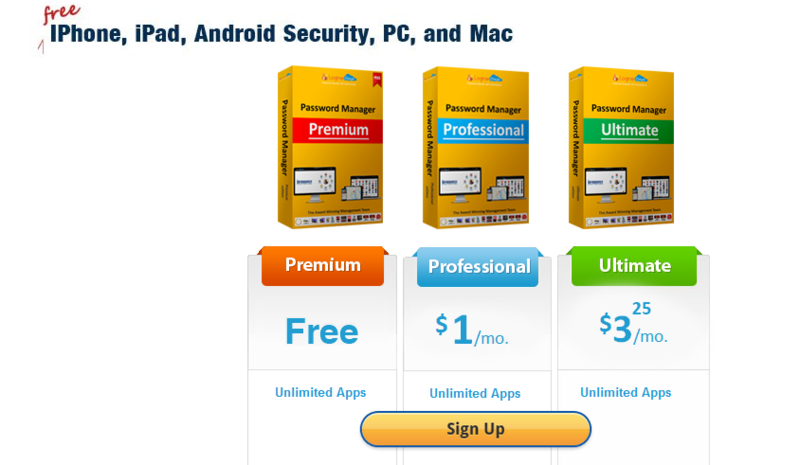 LogMeOnce Password Management Suite Premium is this product’s free edition. It covers most features you’d expect from a password manager. If you need advanced features, then LogMeOnce Professional or LogMeOnce Ultimate is good for you. What’s the difference? For example, users of the free edition can securely share five passwords, Professional users can share 30, and those using Ultimate have no limit. LogMeOnce Ultimate allows users to freeze access to their account but the other two have no such option in their plans. If you purchase the paid version, LogMeOnce provides no hassle 30-days Money-Back Guarantee. 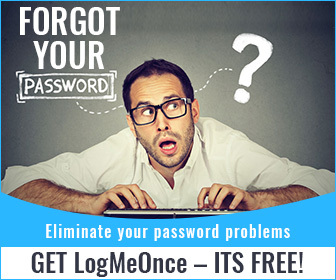 Protect Your Password with LogMeOnce Best Password Manager Now! LogMeOnce also offers an identity management application for businesses. There are Business Plan & Enterprise Plan for you to choose from. The Business Plan ($2.00/user/mo) allows 3 users while The Enterprise Plan ($4.00/user/mo) allows up to 10 users. This version allows an administrator to view charts, locations, unauthorized attempts, user trends, devices, and potential threats to that company. It also offers the same photo login feature as the consumer version, but allows the administrator to verify identification, as well as grant specific access and permissions. It also allows employees to create two, distinct, encrypted vaults — one for personal use and one for business use — allowing them to safely use their own device for business. If you haven’t gotten around to using a password manager yet, it’s time to get started. Everyone should use a password manager because passwords are a real pain. From email to banking, streaming entertainment to social media, the average internet user has multiple user names and passwords to remember. The vast majority of us either use weak passwords or reuse passwords on multiple accounts because remembering multiple passwords is a hard job. However, multiple weak passwords and log in challenges are causing security nightmares, costing valuable time and money, and putting users at risk. What’s the solution then? Storing passwords in a document or writing them down? It’s not a wise decision because it creates a very high risk of being affected by a breach or simply losing the information. Here you will need the help of a Password Manager. A password manager enables you to easily ensure that each password is both unique and strong, and it saves you the bother of looking up, remembering, typing, or even copying and pasting your passwords when you need them. That is to say, when you use a password manager, you don’t need to remember a unique, long, complex password for every online account. Instead, the password manager will remember each password for you, strengthening your security and minimizing your risk. The only password you’ll need to remember is the single “master password” to the password manager itself. Once you have it, life will be much better. LogMeOnce makes auto-login simple. You can choose multiple login options and the password manager allows you to automatically fill in online logins, forms, payment information, names, addresses, emails, phone numbers, and more. But the best part is LogMeOnce allows Login with your selfie photo in order to make your authentication faster and simpler. The PhotoLogin patented technology enables you to log in to any website without typing a password, or use facial recognition tools. Just as its name suggests, people’s passwords are protected by a picture. If you want to log into a website or an app, all you have to do is snap a photo of that same image using your computer’s webcam. Instead of relying on a computer to figure out if the photo is accurate, LogMeOnce sends the photo to you on another device and asks if it’s OK. You say yes, and you’re in. Enjoy PasswordLess access with PhotoLogin! LogMeOnce stores your data on its servers, and on your devices, using AES-256 bit encryption. 256-bit encryption is a data/file encryption technique that uses a 256-bit key to encrypt and decrypt data or files. It is one of the most secure encryption methods and used in most modern encryption algorithms, protocols and technologies including AES and SSL. Governments, the military and banks use 256 bit encryption to protect highly sensitive information. Meanwhile, 256-bit encryption is the strongest encryption available for password management software. The password calculator feature is essentially the same as a password generator on any other password manager. It will generate a long, unique password that you can then customize based on the number and kinds of characters you want to use. You can generate a password using the browser extension and it will automatically save to your LogMeOnce database, or you can generate a new one when you’re adding an entry within the application. To increase the security of your account, you can enable Selfie-2FA on LogMeOnce. 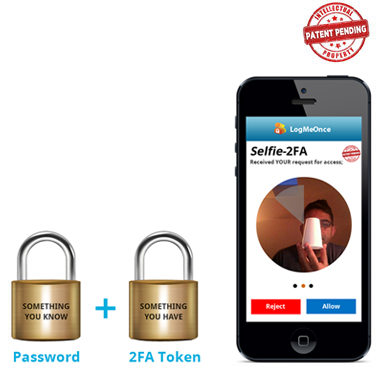 Selfie-2FA is one of LogMeOnce newest Two-Factor Authentication methodologies. Two Factor Authentication, also known as 2FA is an extra layer of security for online users. It will keep your account even safer in the event someone manages to get access to your master password. With 2FA, a hacker will not be able to access your data and it helps to lower the number of cases of identity theft on the Internet, as well as phishing via email, because the criminal would need more than just the users name and password details. LogMeOnce Secure Wallet enables you to store credit card(s) information and auto payments online. LogMeOnce Digital wallet is password protected requiring double-authentication to gain access to credit cards and other payment methods. You may store and use your debit card, credit card, passport, driver’s license or ID, insurance card and even member or loyalty cards. It’s safe, secure, effective and easy to use. Additionally, you can securely backup your personal information, and also includes a note-taking feature to help you keep track of any information you may need to refer to in the future. 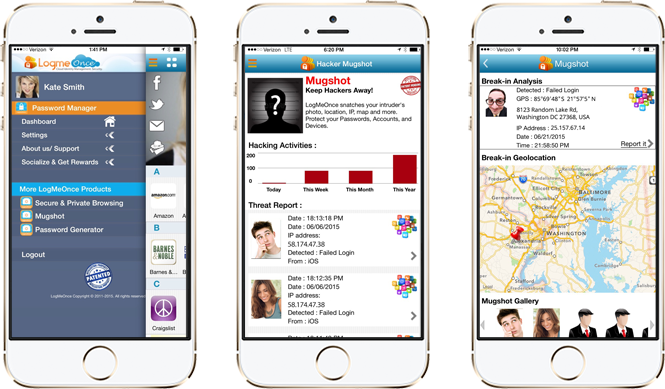 Mugshot is just one of the new features in the latest version of LogMeOnce. It is like an alarm system for your digital property. It tracks unsuccessful log in attempts on your account, then takes a photo of the “hacker,” logs their IP address, GPS location, and adds a timestamp before emailing all of this over to you without the intruder knowing. If you get caught in an emergency situation while away from your computer, you can ask a trusted friend to help you — and grant them immediate access. LogMeOnce Emergency Access allows you to select a trusted contact to securely obtain access to your LogMeOnce Data in the event of death, incapacitation, or simply as a method of account recovery. This feature gives a company the ability to recover a user’s personal data (data that isn’t shared through a group) if they lose their Master Password or are unable to access LogMeOnce. To sum up, once you’ve got LogMeOnce up and running you’ll never have to worry about weak passwords again. It distances itself from the competition by having the most well-rounded feature packages for security. LogMeOnce prides itself on a ‘zero-knowledge’ architecture, meaning that LogmeOnce does not know a user’s encryption key or actual passwords. You are the only one who has absolute knowledge of your actual password and encryption key — only you can decrypt your account. Get LogMeOnce Now & Say goodbye to lost password anxiety! LogMeOnce is a multi-platform security management solution supporting PC, Mac, Android, iPhone, and iPad. It combines password security with real world practicality, creating a fun user experience, and with superb access management efficiency. While using LogMeOnce, you’ll have complete control over your data and passwords because the company does not send or store your master password in any cases. Your information is kept private because your password and associated information are all encrypted with Advanced security encryption technologies such as AES and SHA-512S. LogmeOnce suite provides secure access at anytime, anywhere, on any device using Secure Amazon Cloud. User credentials, which are encrypted on a user’s computer and a user’s browser session, can be accessed securely. These credentials are then deposited and locked into the user’s Cloud Safety Deposit Box with a unique user-selected key. LogmeOnce does not have this (your) key. Besides, Two-factor authentication (sometimes referred to as multifactor or 2FA) adds extra security to your LogMeOnce account by requiring a second login step before authorizing access to your vault. Additionally, you can choose to use the photo login to access your saved information and if someone else tries to login to your account, LogMeOnce will take a photo of the hacker and show the date, time, and geolocation of the hack, as well as the IP address of the hacker. LogmeOnce even protects against Shoulder Surfing and provides protection against Key loggers. LogMeOnce is secure, convenient and free. Download LogmeOnce and Protect Your Passwords! LogMeOnce is a powerful password manager due to its multiple strong and advanced features and technologies. It uses LogMeOnce Mugshot, PasswordLess PhotoLogin, Selfie-2FA, Password SHOCK, Account Freeze, Scheduled Login, Anti-Lock, Mobile Device Management, Kill-Pill, Smart Menu, Personal USB, 2FA Token, Password Dialer, Comprehensive 1FA, 2FA, and MFA offerings, Emergency Access with Photo, Visual OTP, Anti-Theft, Productivity Dock and more to power itself and add more layers of security for customers. Users can enjoy complete privacy by using LogMeOnce Password manager. The password manager adopts the military-grade AES-256 bit encryption to safeguard all your passwords and personal data. No one can access your password manager to steal any sensitive data. Whether you use Firefox, IE, Chrome,Opera or Safari you can easily access your accounts at work, school, and home or on the go. LogMeOnce creates strong passwords and manages all your logins, credit cards, identities, bank accounts, passports and more for you, and it even protects you against fraud and identity theft. Eliminate your password problems now!